EXCLUSIVE | Those bothersome and largely redundant Outgoing Passenger Cards are finally being binned for good, with international travellers no longer required to fill out the green forms from July 1, 2017. 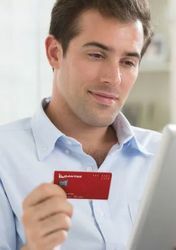 This means there’ll be one less bit of paperwork standing between you and your flight – or even better, your airport lounge. 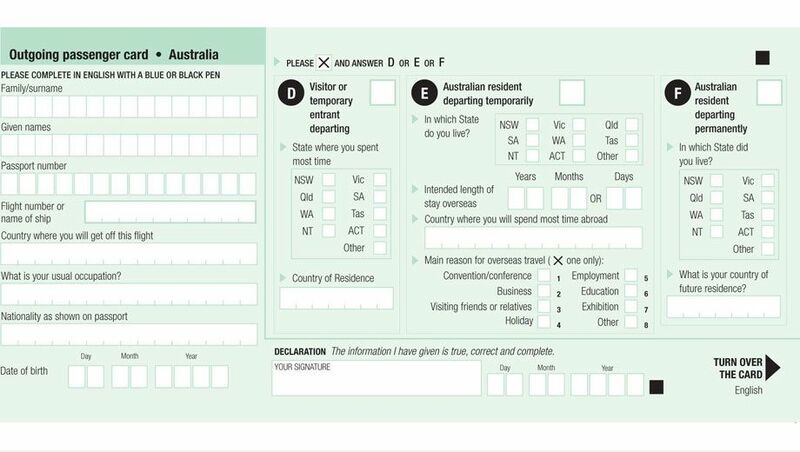 A spokesperson for the Federal Government’s Department of Immigration and Border Protection said “removing paper-based manual processes is integral to achieving a seamless and automated traveller experience”. Core data such as passenger names, flight numbers and destination, passport details and contact information is already available through the Advance Passenger Information System (APIS) operated by all airlines. Travel agents, airport and airline staff are being advised of the July 1 cut-off date. Completing the orange incoming passenger card on arrival into Australia will still be required, although it's understood that a revised version of the orange card will be issued from July 1 ahead of a likely phase-out in 2018. At Melbourne, many people have been ignoring the collection box since the automatic scanning gates were introduced. Exactly - I never understand why they collecting that garbage if not 100% of people filling them. As for the comments saying that people haven't been dropping them in the box, well thats been happening at every Australian airport. In Brisbane someone at the Qantas lounge checkin asked the staff what to do with the card and they said don't worry about it. My next outbound is June 30th. I wonder if QF will still bother giving the green cards out on the last day. Why do we even need to go through immigration when departing Australia. In the USA there is not migration check on departure and they are most security conscious. All the information is already available. nearly every airport doesn't have migration check. I still think foreigners should be required to go through an outbound immigration check, otherwise why are passports even required? I think you'll also find that with the exception of the USA, Canada and reportedly the UK (which I've never been to) all other countries in the world still have an outbound immigration process. Another option would be to have passports scanned at check-in and therefore processed as having departed the country but that method might not pass security wise. I have a little stash of the green forms at home so I can complete them before travelling to the airport. My next flight out is on the 30th of June. They can all go to the recycling bin then. I asked about why the green form still needs to be filled in last time I flew. The answer from the Customs Guy was that they had to work out a way of asking people the question about taking more than $10000 AUD or equivalent in FEX out of Australia (Cross border Movement - Physical cash form needs to be filled in, in that case) in a manner other than the form. Will be interesting to see how that question is handled post 1 July. Don't they ask that on the departure passport scanning screen? What are they going to do with all the staff they employ to check check and recheck the data,Private enterprise would be reducing staff how about the beaucracy ????? I want to complain! I went to the trouble of collecting a thick wad of them to last my flying lifetime and as I won't be going overseas till December, I now have to get rid of them. Im not religious but a hallelujah is in order... i have a bunch at home i pre-fill to stop the mad rush to the sad "bank style " desk with broken Bic pens attached to strings of which half dont work... Now rid us of the incoming yellowish orange card next ! Not sure of these drop boxes in Melb or Bris.. but in Sydney you can get thru immigration without handing one over... and everyone always forgot the last tick box on the back... like a previous poster mentions i think it was just for the 10k cash question. if your carrying more than that you would probably lie about it anyways. Weren't these cards used for statistical purposes as well? I always intentionally misspelt my surname to see if I received any junk mail in the months following. Never did and was never stopped or checked in the 25 years I've been travelling. It's the arrival cards that annoy.. On a long flight, tired and cannot find a pen. I refused to do it last year in SYD due to identity theft concerns, as they were to be dropped into a clear perspex box. I asked the Federal Police counter staff (or were they Customs?) if there was somewhere else to drop them and explained why. They said they're being phased out (that was in October) but at that stage no there was only the perspex box, so I simply "forgot" oops! Obviously they weren't checked cos I never got asked upon return. As an extension of the phase out of hand-written cards in favour of automated gates, why is it that so many other nationalities get to use our automated passport gates (ie: Chinese, Japanese, Europeans, Americans), but when we arrive in/leave those countries, we have to go through the manual process? Europe in particular is a nightmare -- Helsinki almost killed me once. Shouldn't this be a reciprocal arrangement, Border Force/Peter Dutton? Allowing Chinese in particular is strange...they don't offer any special lanes for any foreigners (though from what I've seen, the Chinese lanes are identical to the foreigner lanes other than foreigners being required to fill out a very simple arrival and departure card). You can use the automated gate in the USA. Well, I could. YMMV. You unfortunately can't use the automated gates in the USA if you're entering on most visa types - it only works for visa waiver (ESTA) travellers and for a very small number of visas, and only when you've previously travelled to the USA on the same passport. All others have to line up the old-fashioned way (including those with hard-to-get USA journalism visas...) - and even if you have airline concierge assistance (such as via ConciergeKey), you still have to join the back of the queue. You can only use the US APC if you have a US or Canadian passport, a US Green Card, are traveling on B1/B2 or visas, or a I-94W (VWP) with an ESTA and have entered the US on that passport at least once since 2008. Meanwhile, American's are able to use the arrivals smart gate in AU and won't allow Australian's to sign up for Global Entry - which was part of the agreement to open up smart gate. Maybe canning outgoing cards is OK, but they'll have to do something about those that bring in food and drugs. Are we to rely on sniffer dogs as pax disembark? Making a declaration on a document or other media is important. If pax get the idea that they can be dishonest about complying with Australian law when arriving, then who knows what plants and insects will get into this country. Customs and quarantine must have another system to put in place because THAT'S part of the incoming card requirements. Comment on "Outgoing passenger departure cards will be axed from July 1st"